The OMS portal has been deprecated; you should start using the Azure portal instead as soon as possible. Many experiences are the same in the two portals, but there are some key differences. 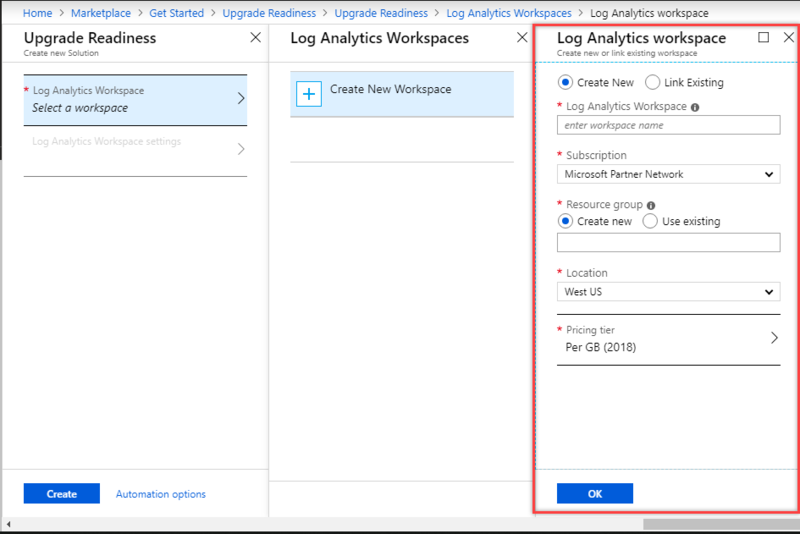 See Windows Analytics in the Azure Portal for steps to use Windows Analytics in the Azure portal. 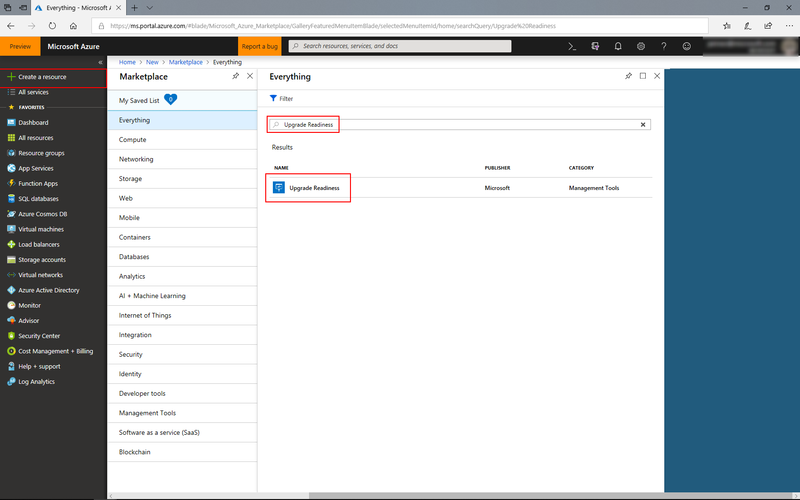 For much more information about the transition from OMS to Azure, see OMS portal moving to Azure. This topic explains how to obtain and configure Upgrade Readiness for your organization. You can use Upgrade Readiness to plan and manage your upgrade project end-to-end. Upgrade Readiness works by establishing communications between computers in your organization and Microsoft. Upgrade Readiness collects computer, application, and driver data for analysis. This data is used to identify compatibility issues that can block your upgrade and to suggest fixes that are known to Microsoft. Upgrade Readiness requirements: Provides detailed requirements to use Upgrade Readiness. Upgrade Readiness blog: Contains announcements of new features and provides helpful tips for using Upgrade Readiness. If you are using System Center Configuration Manager, also check out information about how to integrate Upgrade Readiness with Configuration Manager: Integrate Upgrade Readiness with System Center Configuration Manager. Review data collection and privacy information. Add the Upgrade Readiness solution to your Azure subsctiption. Enroll devices in Windows Analytics. Use Upgrade Readiness to manage Windows Upgrades once your devices are enrolled. To enable system, application, and driver data to be shared with Microsoft, you must configure user computers to send data. For information about what diagnostic data Microsoft collects and how that data is used and protected by Microsoft, see the following topics, refer to Frequently asked questions and troubleshooting Windows Analytics, which discusses the issues and provides links to still more detailed information. Sign in to the Azure Portal with your work or school account or a Microsoft account. If you don't already have an Azure subscription you can create one (including free trial options) through the portal. Upgrade Readiness is included at no additional cost with Windows 10 Professional, Education, and Enterprise editions. 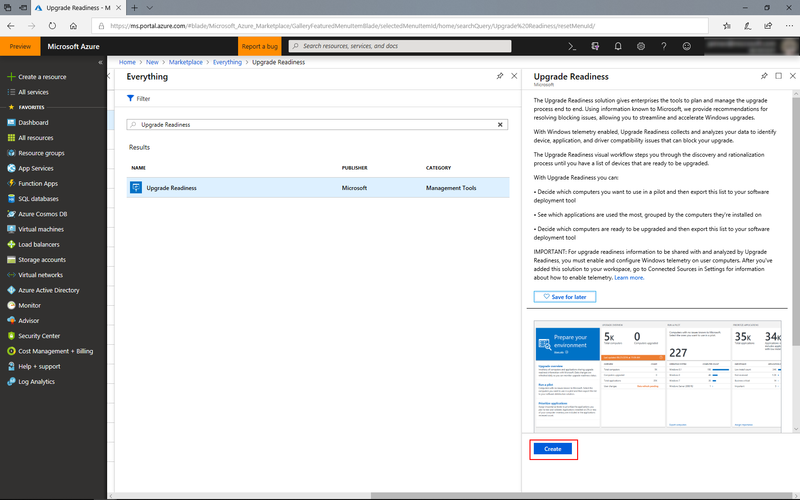 An Azure subscription is required for managing and using Upgrade Readiness, but no Azure charges are expected to accrue to the subscription as a result of using Upgrade Readiness. 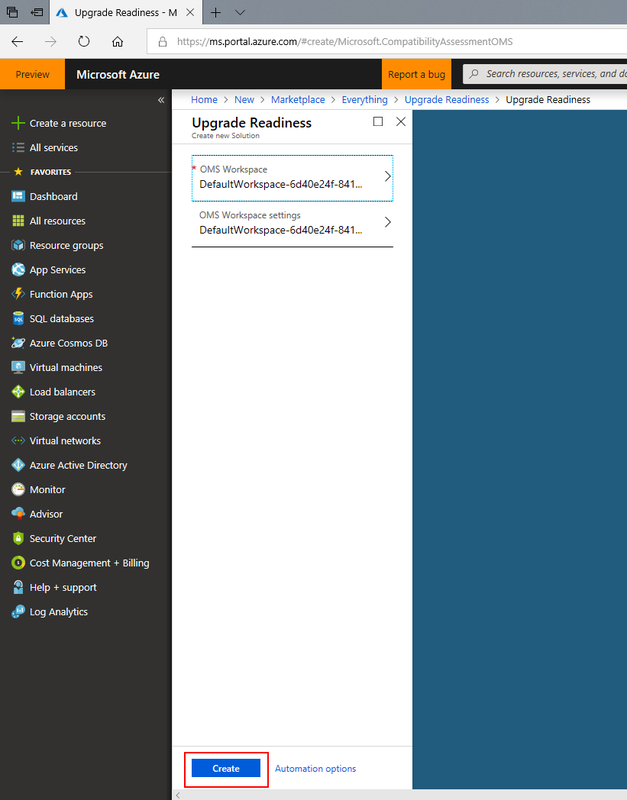 In the Azure portal select Create a resource, search for "Upgrade Readiness", and then select Create on the Upgrade Readiness solution. Choose an existing workspace or create a new workspace to host the Upgrade Readiness solution. If you are using other Windows Analytics solutions (Device Health or Update Compliance) you should add Upgrade Readiness to the same workspace. Choose a workspace name which reflects the scope of planned usage in your organization, for example PC-Analytics. For the resource group setting select Create new and use the same name you chose for your new workspace. For the location setting, choose the Azure region where you would prefer the data to be stored. For the pricing tier select per GB. Now that you have selected a workspace, you can go back to the Upgrade Readiness blade and select Create. Watch for a Notification (in the Azure portal) that "Deployment 'Microsoft.CompatibilityAssessmentOMS' to resource group 'YourResourceGroupName' was successful." and then select Go to resource This might take several minutes to appear. Suggestion: Choose the Pin to Dashboard option to make it easy to navigate to your newly added Upgrade Readiness solution. Suggestion: If a "resource unavailable" error occurs when navigating to the solution, try again after one hour. Once you've added Upgrade Readiness to a workspace in your Azure subscription, you can start enrolling the devices in your organization. For full instructions, see Enrolling devices in Windows Analytics. Now that your devices are enrolled, you can move on to Use Upgrade Readiness to manage Windows Upgrades.